Sailing in the Afternoon shows a nautical scene in the city. Here we see sailing ships on the water in a work with a pleasing color palette of purples and beiges. The work is partially abstract and creates an artistic effect to enhance the beauty of the scene. 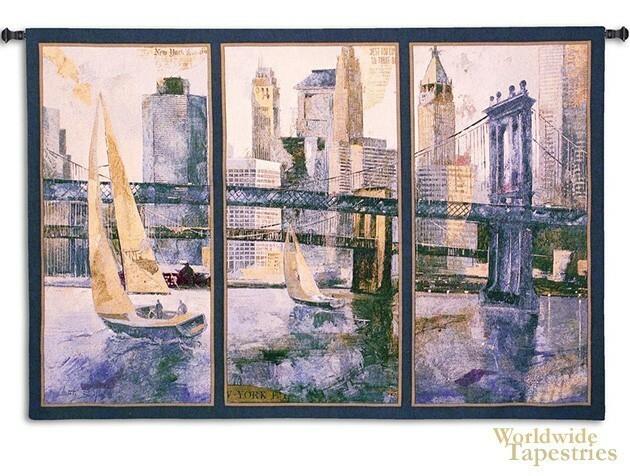 This Sailing in the Afternoon tapestry is backed with lining and tunnel for easy hanging. Note: tapestry rod, where pictured, are not included in the price.